No evening knitting for weeks while I stitched every night. 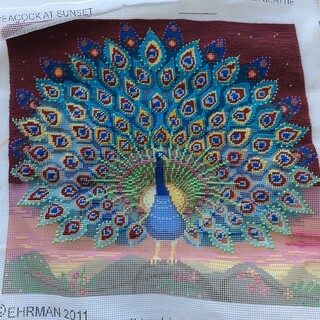 I have it about 75% done now; I am a slow needlepointer. Zoom in and you can see the Invisible Spindle Effect, which I think is way cool. 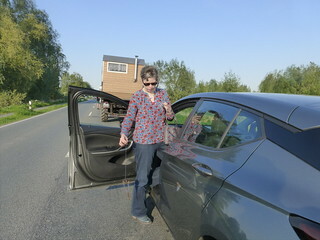 It’s not invisible in its reflection in the car door; odd, no? My moving hands look just plain creepy in the photo. This was ideal bus knitting and is finished but not blocked or photographed, and I’m now on the 4th hat using handspun yarn. Even though it’s older spinning and therefore not so even as my more recent work, the finished products are turning out lovely and I’m pleased. Plus… mmm… my yarn! And as a final knitting distraction besides vacation and injury and needlepoint, early October was the 10-year anniversary of when Mr. MmmYarn was diagnosed with leukemia, and it’s where my brain has been for probably the last 7 weeks or so. Just replaying decade-old events in a merciless loop. Toss in some wishing it could have all gone differently, and, sigh. There is nothing to be done. I will distract myself tonight with a cheesy movie, a glass of wine, and the last of the background behind the peacock’s feathers. I staged the project on the needles in this photo so you could see the right side and the wrong side of the work at the same time. On the right side, you see how the purple peeks through the charcoal a little, creating a slightly tweedy effect. 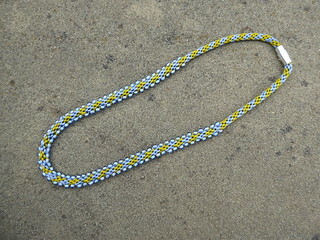 It looks like a mistake in the first few rows, but once it’s an allover pattern, it looks deliberately tweedy. The wrong side shows just how many times I have to trap the yarn for this Armenian knitting technique. It’s a wee bit slower than stranded knitting is for me, but I find it easier to keep the tension consistent than I would have for 8-stitch floats. Onward! Oh, and have you seen Ravelry’s new Index tab on your Projects page? It’s fabulous! I noodled around with a few skeins of yarn on the bus today, trying to decide on color combinations and technique for my next project, the Otto pullover. 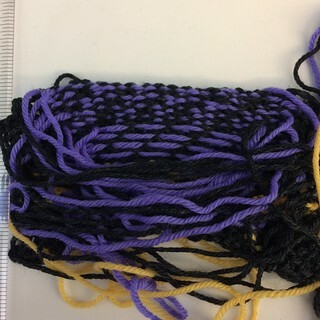 It’s supposed to be worked stranded, but the design has floats up to 8 stitches long and I’m concerned little fingers will get caught in the strands. Not that that’s a tragedy, but I don’t want to make it harder for a parent to wrangle a child into a garment. For stranding technique, Armenian knitting (I have the book from Schoolhouse Press) produced the result I liked best. 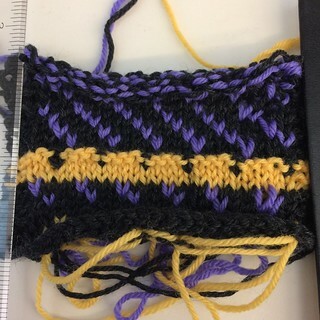 You can see 4 rows of stranding with 3-stitch floats before the top part with the purple yarn trapped every other stitch; that’s the Armenian knitting bit, lots of trapping. Gauge is 7 stitches to the inch (a little big for size 2 needles, but that’s normal when you’re trapping like this) and I like how the fabric feels. 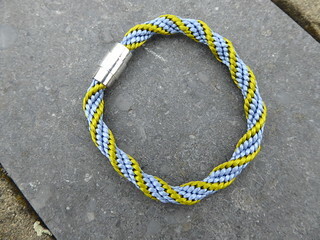 You see long loose strands because I worked the swatch with only the right side facing to emulate working in the round. 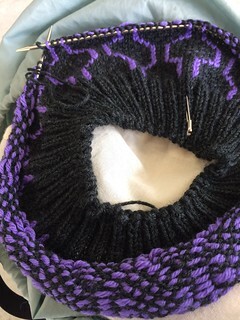 On the ride home, I cast on for the ribbing and got going. This is a perfect bus knitting project so will progress relatively quickly. 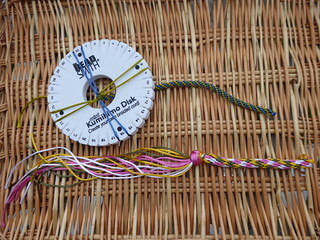 Since then, whenever I need a cord or drawstring, I grab some yarn and the kumihimo disk and go for it. I did not take photos of any of these, but the lanyard for my staff badge at work is pretty stylish in a striped red and orange silk/mohair blend. I felt nervous about 2/3 of the way through the bind-off row despite my friend’s assurances that it looked like I had enough yarn. She was right — I finished off the shawl and had gray yarn left, hooray! Well, here I am once more playing yarn chicken with this same project you saw at the end of April. You would almost think I did this on purpose for the sheer joy of having even more knitting time with this lovely yarn (Annapurna from A Verb For Keeping Warm, which is indeed divine to work with). Think again, readers! The little pile of remaining gray has to last for 6 more rows plus the bind-off, about 3600 stitches total. I have my doubts but will soldier on. 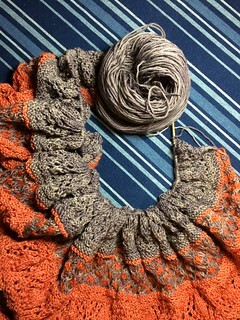 If it lasts only the 6 rows, I’m happy to bind off with orange just to see this shawl complete. While it is possible they were admiring my technique or wondering which salon they needed to go to to get their locks dyed just such a color, it turns out they were lining up to use the bench as a scratching post. 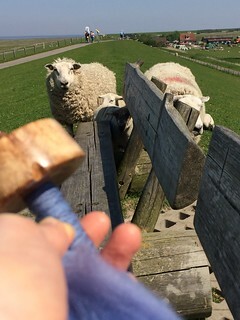 One of the lambs played with my shoe and pants cuff a bit; the sheep here are all accustomed to humans wandering in their meadows and get pretty close. After 3 more hours of knitting, I lost at yarn chicken. 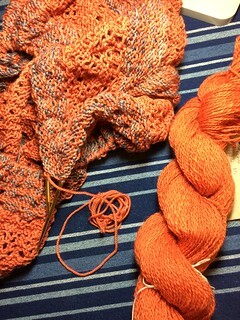 The little coil of orange is all that remains of the Annapurna yarn, with 2.5 rows to go. I hoped it would be enough to finish this row and I would just do the next two rows in gray instead of orange, but no joy. Nothing apt turned up in the scraps bin, and the pretty terra cotta color is hard to match, but I dug around in my handspun and came up with that skein on the right, BFL from Tactile Fiber Arts in a color called Geranium. It’s only 2-ply and darker than the Annapurna, but I have plenty of it (184 yards!) and it will work if I use it symmetrically, so I will rip back to the start of the first orange-and-gray section and use it as the background in both those sections. Unfortunately, this means losing some 14 hours of work, so I won’t finish this in time to show it off in the mystery shawl prizes thread. Disappointing, to be sure, but I finally get to use some of my handspun to a good purpose and that’s kind of nice. Drat the cell phone picture at night, even under a daylight lamp. 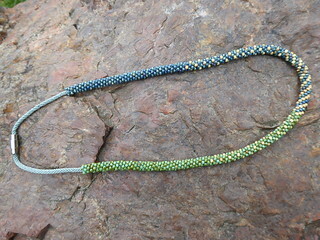 I look forward to finished items photos under a cloudy sky to show the colors off properly. This week, I got to play that sometimes exhilarating, sometimes mood-dampening game of yarn chicken. Twice. 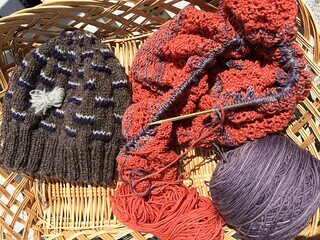 I won on the hat, with far more pale gray left over than I thought there would be. 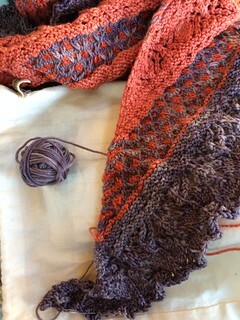 The game is still afoot in the mystery shawl, for which we’re down to an anxiety-riddled finish on this skein. I have 8 more rows of orange to go and 10 grams of yarn remain. The rows are loooong at this point, and this section is striped with the gray, so it’s going to take me a few more hours to know. Wish me luck! I had loosely promised myself no more fiber from Wonderland Dyeworks, because I have a lot of it at home. I love her colors, though, and got sucked into her beautiful booth again, and gosh, some of her fiber found its way into my bag. Funny how that happens. The Friday night pajama party was fun! This is the first year I have been alert enough at 10pm to want to attend a social event (I have one of those “early to bed, early to rise” internal clocks), so I went. 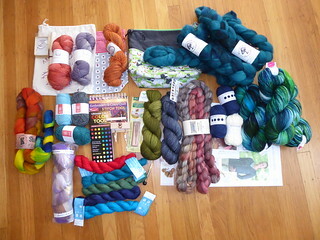 One of the rules of the party was that you can’t talk about it outside the party, but I will dare mention that the mini-skeins of sock yarn in the bottom row of my photo were part of the fun, and the spinning fiber is a prize I got for showing up in my pajamas. 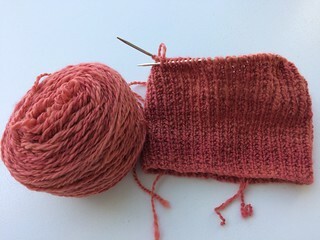 I used up most of the orange Oink yarn for a pair of fingerless mitts, the gray and green yarns are in the planning phases for mittens, I begun swatching for the sweater pattern I bought, and I’m looking forward to starting the mystery shawl on April 6. I am grateful I am able to go to Stitches West and hang out with such fun friends every year. And shop for yarn with them! Such good fortune!